I'm posting this in response to a recent post by Tim O'Reilly which focused on disambiguating what the Semantic Web is and is not, as well as the subject of Collective Intelligence. I generally agree with Tim's post, but I do have some points I would add by way of clarification. In particular, in my opinion, the Semantic Web is all about collective intelligence, on several levels. I would also suggest that the term "hyperdata" is a possibly useful way to express what the Semantic Web is really all about. 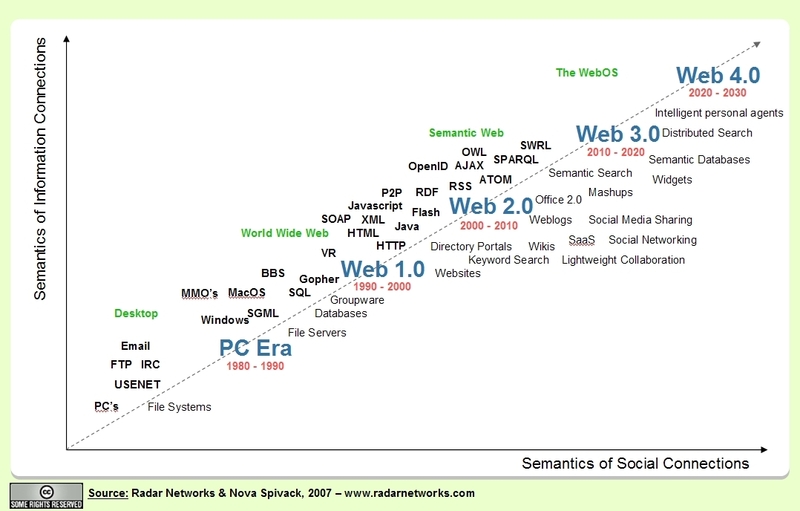 I agree with Tim that the term "Semantic Web" refers to the use of a particular set of emerging W3C open standards. These standards include RDF, OWL, SPARQL, and GRDDL. A key requirement for an application to have "Semantic Web inside" so to speak, is that it makes use of or is compatible with, at the very least, basic RDF. Another alternative definition is that for an application to be "Semantic Web" it must make at least some use of an ontology, using a W3C standard for doing so. Many applications and services claim to be "semantic" in one manner or another, but that does not mean they are "Semantic Web." Semantic applications include any applications that can make sense of meaning, particularly in language such as unstructured text, or structured data in some cases. By this definition, all search engines today are somewhat "semantic" but few would qualify as "Semantic Web" apps. The Semantic Web is principally about working with data in a new and hopefully better way, and making that data available on the Web if desired in an open fashion such that other applications can understand and reuse it more easily. We call this idea "The Data Web" -- the notion is that we are transforming the Web from a distributed file server into something that is more like a distributed database. Instead of the basic objects being web pages, they are actually pieces of data (triples) and records formed from them (sets, trees, graphs or objects comprised of triples). There can be any number of triples within a Web page, and there can also be triples on the Web that do not exist within Web pages at all -- they can come directly from databases for example. One might respond to this by noting that there is already a lot of data on the Web, in XML and other formats -- how is the Semantic Web different from that? What is the difference between "Data on the Web" and the idea of "The Data Web?" The best answer to this question that I have heard was something that Dean Allemang said at a recent Semantic Web SIG in Palo Alto. Dean said, "Sure there is data on the Web, but it's not actually a web of data." The difference is that in the Semantic Web paradigm, the data can be linked to other data in other places, it's a web of data, not just data on the Web. I call this concept of interconnected data, "Hyperdata." It does for data what hypertext did for text. I'm probably not the originator of this term, but I think it is a very useful term and analogy for explaining the value of the Semantic Web. Another way to think of it is that the current Web is a big graph of interconnected nodes, where the nodes are usually HTML documents, but in the Semantic Web we are talking about a graph of interconnected data statements that can be as general or specific as you want. A data record is a set of data statements about the same subject, and they don't have to live in one place on the network -- they could be spread over many locations around the Web. A statement to the effect of "Sue lives in Palo Alto" could exist on site A, refer to a URI for a statement defining Sue on site B, a URI for a statement that defines "lives in" on site C, and a URI for a statement defining "Palo Alto" on site D. That's a web of data. What's cool is that anyone can potentially add statements to this web of data, it can be completely emergent. This is where I think Tim and others who think about the Semantic Web may be missing an essential point. The Semantic Web is in fact highly conducive to "collective intelligence." It doesn't require that machines add all the statements using fancy AI. In fact, in a next-generation folksonomy, when tags are created by human users, manually, they can easily be encoded as RDF statements. And by doing this you get lots of new capabilities, like being able to link tags to concepts that define their meaning, and to other related tags. Humans can add tags that become semantic web content. They can do this manually or software can help them. Humans can also fill out forms that generate RDF behind the scenes, just as filling out a blog posting form generates HTML, XML, ATOM etc. Humans don't actually write all that code, software does it for them, yet blogging and wikis for example are considered to be collective intelligence tools. So the concept of folksonomy and tagging is truly orthogonal to the Semantic Web. They are not mutually exclusive at all. In fact the Semantic Web -- or at least "Semantic Web Lite" (RDF + only basic use of OWL + basic SPARQL) is capable of modelling and publishing any data in the world in a more open way. Any application that uses data could do everything it does using these technologies. Every single form of social, user-generated content and community could, and probably will, be implemented using RDF in one manner or another within the next decade or so. And in particular, RDF and OWL + SPARQL are ideal for social networking services -- the data model is a much better match for the structure of the data and the network of users and the kinds of queries that need to be done. This notion that somehow the Semantic Web is not about folksonomy needs to be corrected. For example, take Metaweb's Freebase. Freebase is what I call a "folktology" -- it's an emergent, community generated ontology. Users collaborate to add to the ontology and the knowledge base that is populated within it. That's a wonderful example of collective intelligence, user generated content, and semantics (although technically to my knowledge they are not using RDF for this, their data model is from what I can see functionally equivalent and I would expect at least a SPARQL interface from them eventually). But that's not all -- check out TagCommons and this Tag Ontology discussion, and also the SKOS ontology -- all of which are working on semantic ways of characterizing simple tags in order to enrich folksonomies and enable better collective intelligence. There are at least two other places where the Semantic Web naturally leverages and supports collective intelligence. The first is the fact that people and software can generate triples (people could do it by hand, but generally they will do it by filling out Web forms or answering questions or dialog boxes etc.) and these triples can live all over the Web, yet interconnect or intersect (when they are about the same subjects or objects). I can create data about a piece of data you created, for example to state that I agree with it, or that I know something else about it. You can create data about my data. Thus a data-set can be generated in a distributed way -- it's not unlike a wiki for example. It doesn't have to work this way, but at least it can if people do this. The second point is that OWL, the ontology language, is designed to support an infinite number of ontologies -- there doesn't have to be just one big ontology to "rule them all." Anyone can make a simple or complex ontology and start to then make data statements that refer to it. Ontologies can link to or include other ontologies, or pieces of them, to create bigger distributed ontologies that cover more things. This is kind of like not only mashing up the data, but also mashing up the schemas too. Both of these are examples of collective intelligence. In the case of ontologies, this is already happening, for example many ontologies already make use of other ontologies like the Dublin Core and Foaf. The point here is that there is in fact a natural and very beneficial fit between the technologies of the Semantic Web and what Tim O'Reilly defines Web 2.0 to be about (essentially collective intelligence). In fact the designers of the underlying standards of the Semantic Web specifically had "collective intelligence" in mind when they came up with these ideas. They were specifically trying to rectify several problems in the closed, data-silo world of old fashioned databases. The big motivation was to make data more integrated, to enable applications to share data more easily, and to be able to build data with other data, and to build schemas with other schemas. It's all about enabling connections and network effects. Now, whether people end up using these technologies to do interesting things that enable human-level collective intelligence (as opposed to just software level collective intelligence) is an open question. At least some companies such as my own Radar Networks and Metaweb, and Talis (thanks, Danny), are directly focused on this, and I think it is safe to say this will be a big emerging trend. RDF is a great fit for social and folksonomy-based applications. Where Tim defines Web 2.0 as being about collective intelligence generally, I would define Web 3.0 as being about "connective intelligence." It's about connecting data, concepts, applications and ultimately people. The real essence of what makes the Web great is that it enables a global hypertext medium in which collective intelligence can emerge. In the case of Web 3.0, which begins with the Data Web and will evolve into the full-blown Semantic Web over a decade or more, the key is that it enables a global hyperdata medium (not just hypertext). As I mentioned above, hyperdata is to data what hypertext is to text. Hyperdata is a great word -- it is so simple and yet makes a big point. It's about data that links to other data. It does for data what hypertext does for text. That's what RDF and the Semantic Web are really all about. Reasoning is NOT the main point (but is a nice future side-effect...). The main point is about growing a web of data. Just as the Web enabled a huge outpouring of collective intelligence via an open global hypertext medium, the Semantic Web is going to enable a similarly huge outpouring of collective knowledge and cognition via a global hyperdata medium. It's the Web, only better. I've been looking around for open-source libraries (preferably in Java, but not required) for extracting data and metadata from common file formats and Web formats. One project that looks very promising is Aperture. Do you know of any others that are ready or almost ready for prime-time use? Please let me know in the comments! Thanks. Microsoft's Astoria project has decided to make RDF a lower priority and is not supporting it for now. So much for Microsoft participating in the Semantic Web. That sounds like a perfect description of a Web 3.0 service-- and a perfect use-case for RDF and SPARQL! But the team at Astoria doesn't seem to feel anyone is actually using RDF enough to warrant supporting that open standard. Well, perhaps among Microsoft's customers that is true enough. But on the other hand, this is a missed opportunity to exercise forward-thinking leadership that will pay dividends to Microsoft in the future when millions of developers and applications will be using RDF as their common language. When is that future? Perhaps as soon as 2 - 3 years. Certainly not more than 5 years. Welcome to the age of openness: The more open your platform and data, the more developers will want to use it. RDF is one of the ways to make data more open, and supporting it in a data-web platform makes good sense. But it's hard to teach a an old god new tricks! I've been poking around in the DBpedia, and I'm amazed at the progress. It is definitely one of the coolest (launched) example of the Semantic Web I've seen. It's going to be a truly useful resource to everyone. If you haven't heard of it yet, check it out! I met today with Jim Wissner, Chief Architect and co-founder of my company, Radar Networks. Jim started the company along with me and Kris Thorisson several years ago when we were just a few guys doing futuristic R&D. Jim has been working for a few months on a "secret project" in his spare time, and today I finally got to see it. I have been hearing rumors of Jim's secret project from some of the other guys on the team for weeks -- but whenever I asked Jim about it he would just get a gleam in his eye and say something like, "Wellllll yeah, I've been thinking about something interesting... but there's nothing to show yet..." Anyway, I've known Jim long enough to know that whenever he's coy about some "something interesting" it is probably going to be something pretty damn impressive. So I didn't bug him too much -- I just figured when it was time he would show me. Today Jim started out by saying he hoped he hadn't set my expectations too high. So I automatically assumed it was just going to be some little widget. But as soon as I saw it I realized that he has built something really MAJOR. In fact, I'm kind of in awe that one developer -- even a developer as good as Jim -- could have done it all himself in just a few months of hacking. He really outdid himself this time. Jim has built something that I think could become a cornerstone of the coming Semantic Web infrastructure. It's something that he has been dreaming about for a couple of years -- but I never imagined that he would actually find time to build it. As Jim put it today, "Well I finally just decided, since I've been talking about this for years, I should just go ahead and build it. It's a lot easier to understand when you see it working." So what has Jim built? I can't say what it is yet, but suffice to say it's something that I think every developer involved in the semantic web space is going to benefit from. It's definitely more of a developer oriented thing -- but something that could catalyze a lot of new innovation, growth and collaboration. After Jim's demo I met with Chris and Lew (who were equally impressed and had seen it earlier during technical discussions with Jim) and we began to discuss the timeline for releasing what Jim has made. We all think it will be a big piece of what we roll out when we go beta. So those of you who are curious -- you won't have to wait that long (but be sure to sign up for our mailing list on the Radar Networks site so you get notified of the closed beta). I haven't blogged much about Jim's contribution to the company yet, but for those who don't know, he singlehandedly built several iterations of our platform. He is a huge part of the DNA of our company but I haven't acknowledged his contributions in public enough. Partly that's because he's our secret weapon, and partly that's because he tends to prefer to avoid any sort of hype -- so he's been patiently waiting until we launch before speaking publicly about what he's built. Jim is a true semantic web "guru" -- as well as inventing our platform, he was also the chief architect for our work on the DARPA CALO program. Jim is a big piece of what Radar Networks is, and in the future, as we begin to roll out our platform I think people in the Semantic Web development community are going to be extremely interested in what he has built. As Jim would be the first to point out: we've got a lot of other great talent in our company and they have all made enormous contributions to various aspects of what we're doing. It's not just him. To do something as broad as what we're building requires a great engineering team, and several great architects, not just one person. That's true. But it's also fair to say that Jim started our engineering team and has been quietly laying the foundations for several years and without his leadership it would never have happened. So this post is a special thank you to Jim. We couldn't have done what we're doing without him and I feel extremely grateful that he joined me in co-founding this back in our New York days before we moved to San Francisco. This post is in recognition of the truly impressive work Jim's been doing. As we begin to roll out our platform, Jim (and our other developers) will begin to blog and speak more publicly about our platform. I do think other folks working in the semantic web area, or writing about it, will find what they have built to be quite interesting, comprehensive, and useful. OK well I've said enough. Jim is probably going to be somewhat horrified by such high praise. But it's well deserved and long overdue. Robert Scoble spent 2 hours with us looking at our app yesterday. We had a great conversation and he had many terrific ideas and suggestions for us. We are still in stealth, so we asked him to agree not say much about what we showed him yet. He blogged a very nice post about us today, providing a few hints. This article on XML.com is a very good summary of the benefits of RDF and SPARQL -- two of the key technologies of the emerging Semantic Web. I've been saying for quite some time that the first thing the Semantic Web will accomplish is "doing for data what HTML did for documents." HTML made it possible for everyone to publish, access and connect documents on the Internet. RDF and OWL -- the languages of the Semantic Web -- make it possible to do the same thing for data records -- structured fragments or collections of data. Today data records exist in a variety of non-integrated formats and standards. RDF and OWL provide a common language for publishing, accessing and linking data around the Web. This first stage of evolution of the Semantic Web can be called the "data web" - a Web of connected data. Once this is in place and lots of RDF and OWL data records exist, and can be queried via SPARQL interfaces by any application, the Web will start to actually function like a giant globally distributed database. This in turn will enable a new era of Web applications that understand the structure and interconnections of data around the Web. For example a search engine that could search for different kinds of product listings across many different sites that publish RDF/OWL data for their product records. Today such a data-aware search engine is hard to make -- each new site that is searched has to be integrated with in a completely custom way. This is sometimes referred to as the challenge of doing "deep Web search." To solve this problem, if product listings of various types were at least mapped to a common ontology (or even a set of ontologies) this would make integration of disparate data types about products easier. By making it easier to operate across data around the Web, data-aware applications can be made to do more sophisticated things with less effort, and they in turn will produce more data for the data-web in a virtuous-cycle. That is the first step. After this we can then begin to make smart applications that help to filter, make sense of, track, suggest, organize, data and assist users. First we have to have rich data -- the data-web -- then we can move to smart applications from there. Back to Web 3.0. There will be one, and it has been associated at this point with concepts of the semantic Web, derived from the primordial soup of Web technologies. It's been a focus of attention for Tim Berners-Lee, who cooked up much of what the Internet is today, for a nearly a decade. I would tend to agree, there WILL be a new generation of the Web, regardless of what we call it. And in fact, it's already gestating as we speak. This post is not to be taken too seriously. I'm not actually advocating for the strategy outlined below. Just pointing out that it is taking place already, at least in iTunes. One thing I've noticed about iTunes on Windows XP is that it is a massive resource hog -- especially when starting the application, but even worse, when exiting it. It typically takes several minutes for iTunes to quit, and during this process there are several moments where my machine freezes up because all resources are being used by iTunes. I like iTunes as a product -- don't get me wrong -- but it is the most impolite app in my system. No other app freezes my computer just to shut down. My computer has a 2.1 gigaherz processor and more than 2 gigs of RAM, and lots of availale disk space, so it's not due to scarce resources. It's simply iTunes. The hassle factor of starting and shutting iTunes is in fact such an annoyance that I have resorted to just leaving it running in the background most of the time. In thinking about this it occurred to me that -- perhaps unwittingly -- Apple has come up with a clever way to make me keep their software open all the time. It's just too painful to close iTunes, so I leave it running.